Today I’m sharing what is likely to be Joey’s favorite post on my blog thus far: my top 10 toddler snack ideas. Lets face it: toddlers love to snack. And if you are around a toddler for an extended period of time, chances are you will join in the eating too. While I’m not one for keeping a strict snacking schedule, I usually have a full arsenal of snacks on hand. I am for a snacking balance in our house—- I too have given Joey a snack as a discipline tool and I’m sure he’s snacked because he was bored [me too]. But we are working on finding that balance and I’m trying my best to ONLY provide snacks if and when he actually is hungry. Keep a snack, a snack. A snack is NOT the fourth meal of the day. Have your child sit down to eat the snack [either in a chair or high chair]. They refuse? They probably aren’t that hungry. Snacking close to lunch or dinner? Offer something REALLY healthy— like good old vegetables. They refuse? They probably aren’t that hungry. Offer water first. Sometimes quenching thirst does the trick. 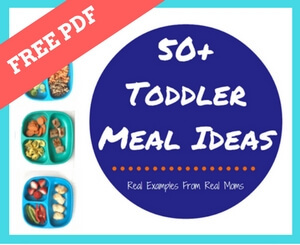 Ok now on to the good stuff, the actual toddler snacks ideas! What I love about this snacking list is that while it might have been created with a toddler in mind, all of the foods included are great snacks for adults too. Hey, you don’t think I’d let Joey snack without me, do you?! Let’s get snacking! Cottage Cheese. Or pretty much any dairy product for that fact. As a high-quality protein source, we can’t get enough cottage cheese or yogurt in our house. From mini-parfaits with fresh or canned fruit to plain and simple, cottage cheese is a snacking win in my book! Joey’s too! Banana + avocado + cottage cheese = our favorite snacking parfait! Hummus. Warning: this snack is MESSY! I’m pretty sure I’ve witnessed a hummus facial or two since Joey started snacking on hummus. We spread it on bread and crackers, and use it as a dip for fresh veggies or cheese cubes. Just like cottage cheese, hummus is an excellent source of protein! We LOVE hummus— especially the Sabra family size! 2 out of 10 sound pretty good, right?! I’m sharing the complete list of 10 toddler snack ideas over on my friend Lindsay’s blog, The Lean Green Bean. Her and I spend a lot of time together talking about feeding our kiddos. All three happen to be at different feeding stages, but we are still learning a lot from one another! Head on over to her blog and check out the rest of the toddler snacking list and be sure to let me know if there’s anything you’d add! Hi there! I came across your blog through your guest post on Lindsay’s blog and I am loving it!! I am a pediatric registered dietitian and newbie blogger and also have two little boys! Can’t wait to read more! Heading over to Lindsay’s blog now to see the rest of the list. Snacking is such an integral part of the day for my kids. Then again, I’m a snacker so it’s really no wonder! So important to “keep a snack, a snack” I couldn’t agree more! Just read your 10 snack ideas – excellent and healthy, love it! Loved these ideas! Can you tell me the brand of the popsicle mold in the picture? Looking for one that is good for toddlers. Click bait to have people go to your “friend’s” blog. Lmao. That desperate eh?? Nope not desperate at all. Just providing content on a friend’s blog and wanted to share a teaser. But thanks for your positive feedback!